You Have Been Watching…Tunes of Glory | Scots Whay Hae! Certain films take you by surprise. You come at them with preconceived expectations and leave with those confounded. The poster, the cast, the trailer and accompanying soundtrack normally work together to prime you for what you are about to watch but every now and again they lead you in the wrong direction. One such film is Tunes of Glory. Everything I knew about Tunes of Glory led me to believe that I was going to watch a film concerned with the traditions of Scotland coming under attack from an English invader. There are aspects of this, but the Scottish traditions that feature, and the Englishman who challenges them, are more complex than I was expecting. 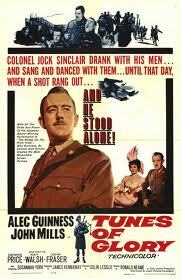 The script is an adaptation of James Kennaway’s debut novel of the same name, and the characterisations are as subtle and memorable as you would expect from such a writer, but what really makes the film are the performances from the men who play the main protagonists; those future Knights of the Realm Alec Guinness and John Mills. It will be a shock to nobody that Guinness is superb as Jock Sinclair, the man from Glasgow who joined the army as a young man by way of fights on Sauchiehall St and a spell in Barlinnie. Guinness perfectly captures the bullying peacock that is lost in his love for whisky, revelry, and what he believes is the undying, and universal, admiration of his men. The drama comes when he is given a new commanding officer played with typical restraint by Mills. His character Lt Col Basil Barrow is everything that Jock is not, and who represents all that the Scot despises, and perhaps envies. As the film unfolds there is a battle for the hearts and minds of those they would command, and the men, like the audience, see their loyalties torn as the film progresses. The film was directed by the late Ronald Neame who would go onto direct The Prime of Miss Jean Brodie (see You Have Been Watching…The Prime of Miss Jean Br…), Scrooge, The Odessa File, and, one of my favourites, The Poseidon Adventure, as well as screen adaptations for Blithe Spirit, Brief Encounter and Great Expectations. With Tunes of Glory it appears as if there is not much directing needed, which is surely a sign that the film was in safe hands. In many of the obituaries that followed Neame’s death in July this year it was said he was an ‘actor’s director’. That slightly ambiguous tribute makes perfect sense after watching Tunes of Glory. When faced with such great actors it may seem as simple as pointing the camera and standing back, but the fact that his films are marked by great performances (think Maggie Smith as Jean Brodie or Albert Finney as Scrooge) shows that he was a man who could draw the best from actors and refuse to let other aspects of the film overshadow them. The film has its flaws. The key dramatic twist arrives far too abruptly (and is ludicrously given away on the film’s poster), and Susannah York is wasted as Jock’s lovestruck daughter, but if you’re looking for something a bit different then I would suggest Tunes of Glory. It’s not the story that will stay with you but the very different central performances that show two of Britain’s finest actors in their prime. For those alone it’s worth an hour and a half of your time. One word of warning. If you’re adverse to the bagpipes, best steer clear, or at least have a hand on the volume control.